A revamped edition of the award-winning DS first-person shooter Moon Chronicles has become, quite oddly, the very first first-person shooter on the console three years into its lifespan. That makes it something of an oasis in a desert for Circle Pad Pro owners and FPS fans who own a 3DS, but is it worth buying on its own merits? Rarely have I experienced 60 frames per second in a video game, and most of that has been with PC games such as Unreal Tournament 2004 when I was playing them on hardware far more advanced than the game required. Considering the less than stellar graphics in Moon Chronicles, I would say it's a safe bet that it's not exactly taxing the 3DS processor. But that doesn't really matter. What does matter is that this game looks great in motion. A very welcome aspect of gameplay I found while playing Moon Chronicles on Normal difficulty is that its combat is tough in spots but not overly so — challenging but fair. Enemies would doggedly pursue me, firing blast after blast in my direction. Bosses were powerful and relentless with their attacks, and one boss even sent swarms of lesser enemies after me. But as long as I kept moving and taking cover behind columns or around a corner, I was able to make it past the encounter intact. Fans of old school FPS games such as Doom will undoubtedly feel right at home inside Moon Chronicles' blue-green corridors. Eschewing modern comforts such as regenerating health and shields (except for regenerating vehicle shields during a short vehicle segment), Moon Chronicles has players picking up health packs from fallen enemies to replenish lost health; and your character has no shields over his health bar. (Health can also be replenished at save points.) You start the game with an infinite ammo gun called the Super Assault Rifle; but during Episode 1, you pick up a heavy pistol with a limited supply of ammo that can be refilled with ammo cartridges dropped by defeated enemies. This one is kind of a shame, because it could have been fantastic if the development team had just taken the time to implement true analog functionality for the Circle Pad Pro's right circle pad. As it stands, all they did was map ABXY controls for looking around to the right circle pad. The result is something that I find works well enough, but it would have been nice to have the extra precision of true analog controls. On the bright side, the game allowed me to choose which trigger button to have as the action button (opening doors, reading terminals, etc.) and which one to have as the firing button. In order to progress at certain points, you'll have to guide a small robotic helper through shafts and other tight areas so that you can disable a force field that blocks your path. Your helper can also be used to find the three artifacts that, once collected, will unlock a training mission. I suppose these segments can be a nice little break from the running and gunning, but they also feel like a chore I have to complete before I can move forward. This mode is your reward for finding all three hidden artifacts in Episode 1. As rewards go, it's sort of an odd one. This is supposedly a training mode, yet you have to play through most of Episode 1 in order to unlock it. The training mode is fun (and possibly more intense than the main game) — I just don't know why it exists. I think I can easily argue that the Dreamcast-looking graphics in Moon Chronicles contribute to the game's old school charm, and they probably are what allowed the development team to achieve 60 frames per second. That being said, we're still talking about pretty basic-looking corridor stuff (although there are a couple of genuinely cool-looking corridors that feature some moody red lighting). So the graphics are not exactly impressive, but that doesn't necessarily hurt a game like this. And the frame rate does quite a bit to make up for the graphical shortcomings. The music is pretty mundane and repetitive, but it really didn't have to be anything special for this game. It sets the right mood for a corridor shooter, and that's plenty good enough. Sound effects range from laughable to nicely atmospheric. Walking sounds like mining dirt in Minecraft, and your "Super Assault Rifle" (I wonder if they made up that name as a joke) sounds like a pathetic pea shooter. However, a machine noise made by a small wall-crawling robot can actually be somewhat disconcerting, and one particular type of corridor makes an eerie artificial pulsing sound. If there's just one thing in this game that gives it away as a project done on a shoestring budget by a small independent developer, this is it. The voice acting sounds like the programmers got together in their spare time to record some dialogue. It's not as bad as, say, the voice acting in the original Resident Evil, but it's pretty obvious that no professionals were involved. The dodging-and-hiding combat may be good, but the enemies themselves are just sentry bots (mostly floating ones) — nothing particularly interesting. There is a hint that an alien species may be encountered in a future episode, so here's hoping the robotic enemies in Episode 1 are just fodder to get the player accustomed to Moon Chronicles' combat before the real threat is revealed. Moon Chronicles allows players to replay chapters of the episode they've completed. How could such a simple feature be terrible, you ask? Well, it's terrible because the first episode was divided into four very unequal chapters. Those chapters are the prologue (about 4 minutes for me), most of the episode (about 69 minutes for me), the final boss (about 3 minutes for me), and a short post-final boss section (about 17 minutes for me). Did you catch the problem in there? Yep, the replay function is fine as long as all you want to do is, say, fight the final boss again. But if you're looking to replay something specific in the very long second chapter, you'd better be prepared to basically play through the episode again. 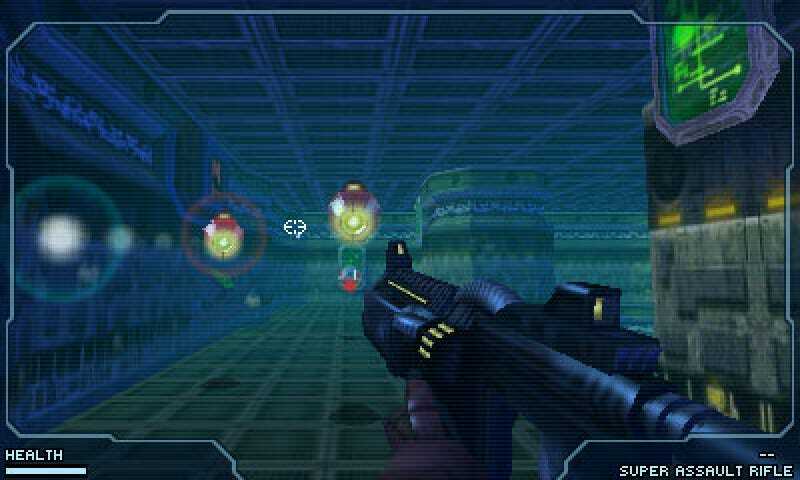 Moon Chronicles can be a fun trip down Classic FPS Lane, and I can't praise the frame rate highly enough; but bland enemies and the lack of true right analog functionality for the Circle Pad Pro make this a tough one for me to fully recommend. You may purchase Moon Chronicles, Episode 1 - A Small Step for $8.99 through the 3DS eShop. I finished Episode 1 and VR Training I on Normal difficulty. I also finished the first two chapters of Episode 1 on Veteran difficulty. Total playtime for me on Normal (which was my first playthrough) was about 93 minutes for Episode 1 and about 13 minutes for VR Training I. My eyes make it impossible for me to experience and review 3D gameplay, but I did notice that the frame rate seemed as smooth with the 3D turned all the way up as it did with it turned off. Can anybody out there tell me what award(s) the original DS version of Moon Chronicles has won? I keep seeing blurbs about it being an award-winning game, but that's all the information I have.